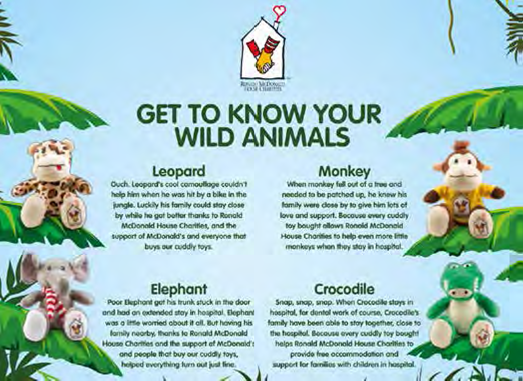 This October, McDonalds will be bringing a jungle theme to the restaurant, with four NEW wild animal soft toys for customers to purchase for £2.50 each. All profits from the soft toys will go to the Ronald McDonald House Charities. 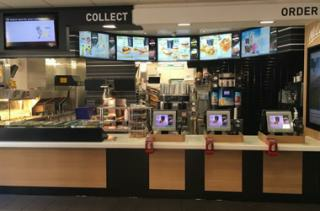 McDonald’s has supported Ronald McDonald House Charities in the UK since 1989. The Charity keeps families close to their children in hospital by providing free ‘home away from home’ accommodation and support. More than 60,000 families have been helped by the Charity, and we’re proud to have contributed to this amazing milestone. The Charity is committed to opening more Houses at specialist children’s hospital so that more families can get the support they need. However, Ronald McDonald House Charities desperately needs our fundraising support to contribute towards the £20Million+ needed over the next few years to open four new Houses across the UK. The family fun day will be on Saturday 22nd October and there will be face painting and balloon modelling for lots of family fun!